Anitha Madikizela reports on the KSL T20 Final: Loughborough Lightning vs Surrey Stars. The Western Storm fell at the final hurdle as Surrey Stars stole through to the final. The Stars struck a moral victory over the Western Storm in a dress rehearsal for their 2018 Women’s Cricket Super League semi-final rematch in Brighton on Monday, 27 August, writes ANITHA MADIKIZELA. The Loughborough Lightning cantered to a bonus-point win over the Western Storm, writes ANITHA MADIKIZELA. Lizelle Lee’s Western Storm have made it to the Super League semi-finals, joining Dane van Niekerk’s Loughborough Lightning. 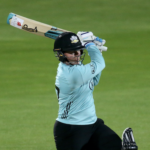 Lizelle Lee scored a half-century as she inspired the Western Storm to a five-wicket win over Marizanne Kapp’s Surrey Stars.